UPDATE on this post. Although there has been some additional discussion, and the test has been allowed to run another 24-hours, not much else has changed over the past 24 hours, apart from knowing that the anomaly on the BOP is a slight leak on the flexible joint. I am going, therefore, just to add to the earlier post, to give an update on the overall situation. I rather suspect that we will know a lot more about the behavior of the sediments and matter at the bottom of the Gulf within the next year or so than we have learned in the past hundred years. I am looking at the view from the Skandi ROV 2 at 10 am on Monday, and it is looking at a patch of mud that is bubbling a little, though over a relatively significant area (that of the camera illumination). There is no trace of oil venting and flowing upwards (and a fish just swam by) so there will be, no doubt, some samples taken, and, over time, we will learn what is the cause. There were other views, from different ROVs that seemed to show clouds of something, but the definition was poor and it was not clear that this was not mud that the ROV itself has stirred up. This has been the case several times today, in watching the video, though there were, in the seep area, shots of small drops of oil heading up to the sea surface. Our first relief well, the total depth is at 17862, that’s our casing point. We’re four feet horizontally from the Macondo well at 2.8 degrees and we’re looking directly at the Macondo well. So we’re absolutely perfectly positioned. The team is feeling very good about how they’ve set this well up. The pressure in the well itself has rise to over 6810 psi and is rising at about 1 psi per hour. This lower pressure than the pressures originally estimated makes it possible to reconsider the top kill option. This is where, by feeding mud into the top of the well through the kill line, while the well is shut-in, the mud fills up the well. (The oil and gas are pushed back into the formation). Then should they be able to fill the well up with this mud, the weight of the full column of it, down the well, would be high enough to balance the pressure of the oil in the formation. At this point, rather than the well being shut in, by the cap, it becomes killed by the mud pressure on the flow. There is no longer any concern about pumping the mud in at any high rate of pressure, since the flow is already stopped. Instead the mud flow and pressure can be set to a slightly higher pressure than currently is in the well, and then slowly increase the flow to fill the well, without bringing the pressure to such a high level as to further compromise the well integrity. The injection would be followed with cement, to seal the well at the top of the underground part. This would later be followed by the well intersection by the relief well, and an injection of cement at the bottom of the well. There are three areas where concern has been raised over the possibility of oil escaping the well below the sea bed and migrating back up to the surface. 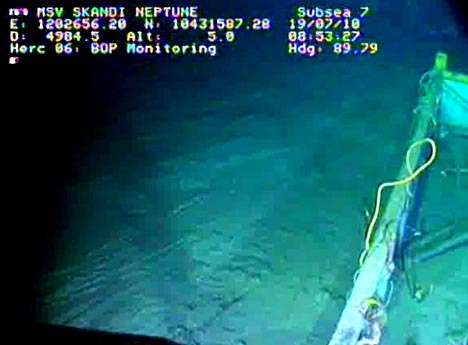 This is why the ROVs are located around the well monitoring the sea bed itself. There are, as noted earlier, patches where the sea bed is evidently bubbling (in that you can see where the bubbles pop out of the mud). But there is no sign of gas or oil then slowly rising to the sea surface from the bubble action. It may, therefore be something like a field of clams sitting below the surface and aspirating and then spitting out some of the sea water. This action is not at the moment of concern, BP has checked the fluid coming out of the sediment and it is running at around 15% methane, which could just arise (according to Mr Wells) from biodegradation in the mud below the sea bed. There is a natural seep some 3 miles from the site, this hydrocarbon flow has been tested and is not related to the Deepwater Spill. And so the only other area of concern is a very small leak coming out from the seal in the flexible joint (which, if you remember was straightened before the new cap was installed). The leak, at the moment is very small, and not of that much concern. However if the leak starts to get bigger, and then turn into a stream, it may pick up some of the sand that is reported as being a concern from being in the BOP assembly. This will then, at the pressures anticipated, be enough to erode out the leak to an unacceptable size within a couple of hours. For now, however, it is very small, and not continuous flow, and so can be viewed with less concern, relative to other issues. The leak was detected in a flange between the top of the well and the rams that regulate flow up the main bore. Video footage is showing some hydrate build up on the outside of the stack and scientists believe a small amount of oil and natural gas is leaking out. Allen said the leak is not expected to hurt performance of the device and is not seen as a threat to its structural integrity. Paragraph two says there is no evidence of oil leaking. Paragraph nine elaborates upon the oil leaks. BP said they "tested" the oil at the surface leaks away from the well head and said it was not related to the oil spill. Since they own the ROV's, there is high confidence you can't prove that they are lying. BP has said the pressure "has rise to over 6810 psi and is rising at about 1 psi per hour." Days ago they showed the pressure gauge they were using. It was too coarse to indicate 6,810. They haven't shown the gauge since then. For that matter, they aren't showing the leaks to the public anymore. The surface oil leak could be from a leak in the pipe at least three miles down where the pipe was eroded by the rock and sand flowing by. That would be good. The leak could come from where the crushed rock had fallen away from the pipes and concrete part way up from the anticline. This would happen as the heavy flow up the pipe carried away the rock & sand around the mouth of the pipe. Crushed rock from drilling would have fallen into this open space. That would be bad. The pressure is read with transducers embedded into the equipment, and not with the gages that are read by the ROVs. Those gages measure system hydraulic pressures and relate to equipment operation. The sensitive data is all transmitted to monitoring stations beyond our view, so that we must rely on the information provided.